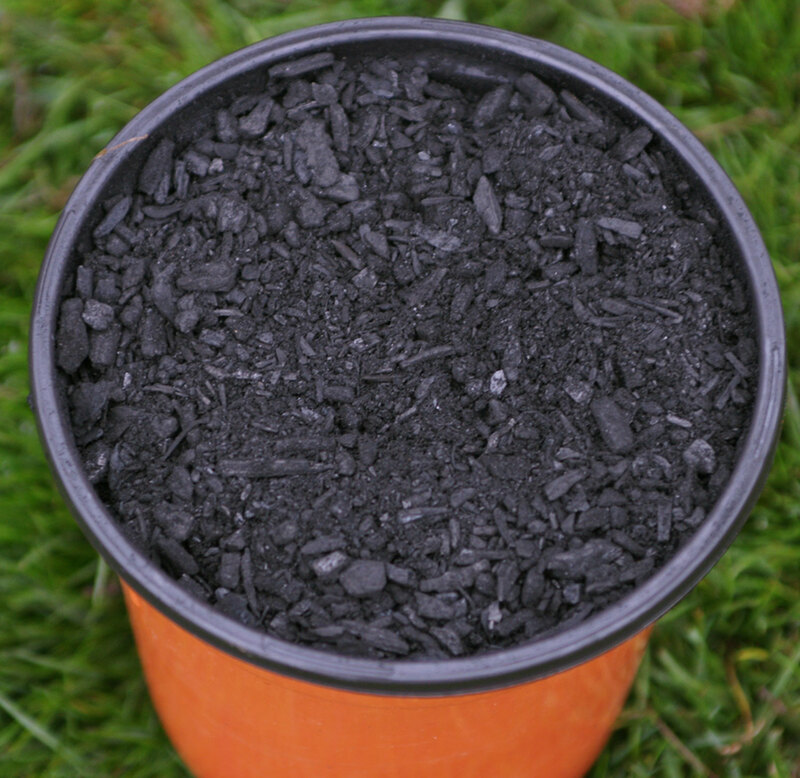 Biochar (or agrichar) is one of the products created when high-carbon materials such as wood scraps and the woody, undecomposed fraction of yard debris are gasified under low oxygen conditions (pyrolysis). The process produces both syngas for green energy and biochar to be used as a soil amendment. The use of biochar goes back thousands of years, deliberately so or not. In the Amazon Basin today, there are rich and fertile, black soils (Terra Petra) that are the result of carbon left behind from the fires and cooking of indigenous people. These soils have held their fertility over thousands of years. Sonoma Biochar allows you to reactivate this ancient soil-building technique. Today this biochar is produced while creating green, renewable energy. 1 Cubic foot of Sonoma Biochar is applied to the surface of 48 square feet of soil. Cover the Biochar with a high quality compost and water well (we recommend 4 cubic feet of compost). Move the biochar and compost back and forth to make sure it all gets moist. This step will allow the water running through the biochar-compost mix to form a compost tea that can be absorbed by the Biochar, thereby 'charging' it. Next, work the compost and biochar into the top 8-12 inches of soil and water well. Allow the soil to come to equilibrium for a few days, continuing to irrigate regularly. Next, hold off on watering until the soil feels just moist, not wet or dry. You are now ready to plant. Biochar is applied only once, but the results will last forever as long as you keep your soil biologically active. Annual applications of compost, mulch, cover crop, etc. will recharge the biochar over the years. We do not ship cubic foot bags, pick up at retail yard only. Please call ahead at 707 664 9113 for availability. What Are the Reported Benefits of Biochar? Biochar, a very porous medium, can be seen as a hotel for microorganisms. The compost provides the food that the microbes need to proliferate leading to increased microbial diversity and populations. In addition, biochar has high cation exchange capacity (a negative charge) and as a result will hold on to positively charged nutrients, conserving nutrients. Biochar also has a high water holding capacity and thus reduces irrigation needs. In addition, since biochar lasts for thousands of years in the soil, carbon that plants have fixed from the atmosphere is now removed from the carbon cycle and is banked in the soil. This process is called carbon sequestration. Carbon sequestration is an effective tool in reversing global warming.